I guess today the site is called this is electric guitar! My good friend and colleague Adrian Verdejo has just released a brilliant recording of new music and modern works for electric guitar. 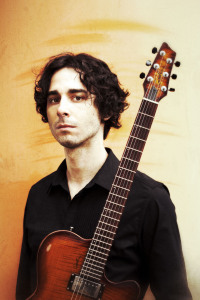 Adrian is an excellent classical guitarist but also plays a ton of new music on electric guitar. I met Adrian about twelve years ago at Capilano College in Vancouver and we were later roommates in Victoria. We now play in the Victoria Guitar Trio together with another good friend, Michael Dias. Adrian has always amazed me with his ability to seek out new music that is interesting and listenable. Make sure to go to his bandcamp and listen to samples. You will love it! Adrian is now based out of Vancouver, BC, Canada. Modern Hearts – New Music for Electric Guitar is the debut album from Vancouver guitarist Adrian Verdejo. This album features music for multiple electric guitars and bass by contemporary composers. Contact Adrian via his website for hardcopy CDs. Recorded by Braden Kwasnicia at Ampersound Studio. Mastered by Brock McFarlane at CPS Mastering in Vancouver. Photo and CD cover design by Mark Mushet. 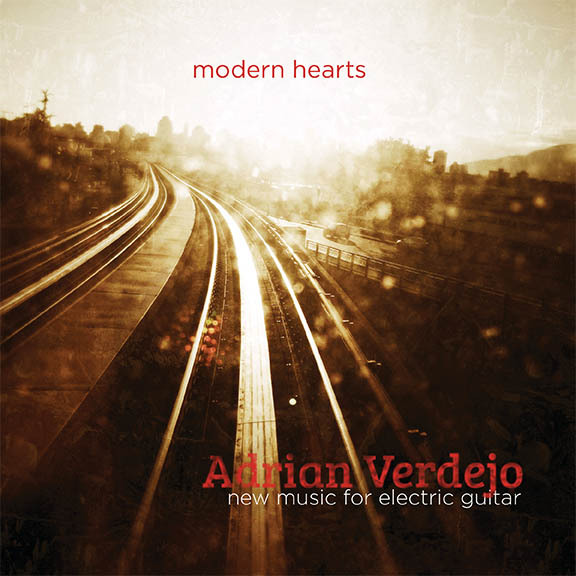 Modern Hearts by Adrian Verdejo delivers all the accuracy, precision, and interpretive genius of a top notch classical musician mixed with the raw energy, flare, and recording prowess of the modern electric guitarist. This album is a sonic world of wonders! A must hear for new music enthusiasts and general listeners alike. When people think of new music they often wrongly imagine an array of unlistenable 20th century experiments. This album will boost your appreciation of highly listenable new music that is innovative and interesting but as enjoyable as your favourite records. The works are a refreshing reminder that composers of today are attracting new fans and can relate to modern listeners. I love the work Nebula by Vancouver composer Jordan Nobles. It has an expansive soundscape that simultaneously gives the impression of timelessness as well as unraveling forward motion. Plus, this track really highlights the spectacular recording quality. I also have fond memories of performing gwan by Scott Edward Godin in concert with Adrian years ago. The work has an interesting development and deconstruction in the later half. Plus you get some irresistible grooves and thrash too! The Sharman is fun little work and Vampyr is rocking as usual! It’s a great album, I highly recommend it. Don’t just take my word for it, listen to samples! From the delicate and ethereal soundscapes of Jordan Nobles, the groove and thrash or Godin, or the hypnotic textures of Tenney, Adrian Verdejo delivers and album of wonder, curiosity and pure, focused energy. Bravo! Bradford Werner: With a new album, a classical and electric concert schedule, and teaching, it sounds like Vancouver is keeping you busy! How is the guitar and new music scene there? Adrian Verdejo: I’ve lived here for only 2 years, but my impression has been that both the new music and guitar communities are quite strong. Vancouver has many talented guitarists and composers working in a range of styles and I’ve been fortunate to cross paths with several of them. I see from my students and with the younger generation of players and composers that the future for Vancouver’s musical scene is very promising. BW: How have you found having a foot in both the classical and electric scene? Do you think electric guitar compositions are going to start becoming a norm for classical players or is it really a different instrument and scene? AV: My sense is that there is and will be much more of this kind of crossover happening but that it’s foremost guided by musical necessity. I used to think of myself as a former electric guitarist who decided to focus on classical music, but now I don’t see as much of a difference between the worlds of classical or electric guitar – at least in relation to contemporary music. Very often composers will go for a sound first and may be less concerned with the specific type of guitar. Or, if they are writing for guitar in an ensemble, amplification may only considered on a practical level. I have found it very rewarding to work with composers who have less familiarity with our instrument, and in helping them fit their ideas onto the guitar. On the other hand, I also love interpreting music by guitarists and getting a sense of their playing and how they use the guitar in their compositions. BW: Can you tell us a little about how this recording project came into being? curiosity of electric guitarists, non guitarists, or those who may not have otherwise encountered this music. BW: There seems to be a lot of compositions out there but it can be difficult to find or get the scores. You seem to have found pieces that compliment each other nicely and the overall vibe of the recording feels great. How did you go about selecting or finding the repertoire? AV: Thanks! I did intend for the combination and sequence of pieces to evoke a certain feel for this album. I agree that it can be challenging to find the right pieces among the vast works lists and instrument catalogs out there. Often you may come across something which has an appealing instrumentation or maybe you have some familiarity with a composer but there are no available recordings or score samples. I have found it useful to contact the composer directly whenever possible and, in Canada, we are very fortunate to have the Canadian Music Centre as a national library resource. They have cataloged thousands of pieces by Canadian composers and have made them available via a free library mail service and expansive web archive, creating an important bridge between composer and performer. 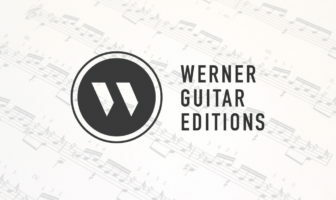 I have used the CMC’s resources to find some fantastic contemporary guitar music. BW: The album sounds amazing, not just the playing but also the sound, can you tell us more about the recording process? AV: Once the initial tracking for most of the performances was done, I then went to Ampersound Studio in Vancouver to “re-amp” everything for the final album mix. This is a great way for electric guitarists to save on studio time by capturing the performance first and dealing with the sound later. Digital recording has many advantages and allows for making decisions later, so my approach was to get a “sound sketch” for the performances and then to later commit to the final sound in the studio. I worked with Braden Kwasnicia, an excellent recording engineer. We used a combination of various guitars, amplifiers, microphones, effects and recording techniques to get a distinct character for each piece and hopefully we found a unified sound along the way. This was the process for most of the music you hear on the album except the work by Lizée, which was performed and recorded during that same session at Ampersound. Tenney’s Septet and Nebula by Jordan Nobles took much longer to complete because the layering, editing, mixing of the various guitar and bass parts was quite involved. BW: Did you interact with the composers much? Have these works had much exposure before? AV: The Tenney and Murail have had the most exposure, if only because they are the oldest pieces on the album. The other pieces, all by Canadian composers, were performed before I found them but had not been recorded. I corresponded with these composers regularly during the making of “Modern Hearts”, they offered invaluable guidance and feedback on my interpretations and at various stages of mixing the recordings. BW: What’s next for Adrian Verdejo? AV: I have a number of performance engagements in BC in coming months which will keep me busy practicing. I’m performing with a few ensembles and some solo work also. I’m excited to present a new program of mostly Canadian works with the Victoria Guitar Trio in the Spring (Bradford, maybe you’ve heard of them?). There will be a CD release concert for “Modern Hearts”, presented by Redshift Music Society in Vancouver – date TBA, and I’ve started planning for the next album, which will feature some of my favourite contemporary works for solo classical guitar. Contact Adrian via his website for hard copy CDs.